Discussion in 'Engine' started by AntMB, Feb 11, 2019. Does anyone know or have a good map of the fuses and relays? I have the handbook for the car which is not helpful with identifying fuses and relays. I've searched online but I only get photos of fuse boxes rather than a good layout/map of them detailing the number of each and what each is for. There's usually a sheet of paper charting all the above situated in the Fuse box End of the Dash Drver's side Pull the cover off to expose. I have that sheet but it doesn't appear to detail relays. I can get it for you from the WIS (workshop manuals). If I remember they are well detailed on there. Il look it up when I get home. What year is your S211, there’s two configs depending if your car is a facelift or not. 2003, would my VIN be of any help? 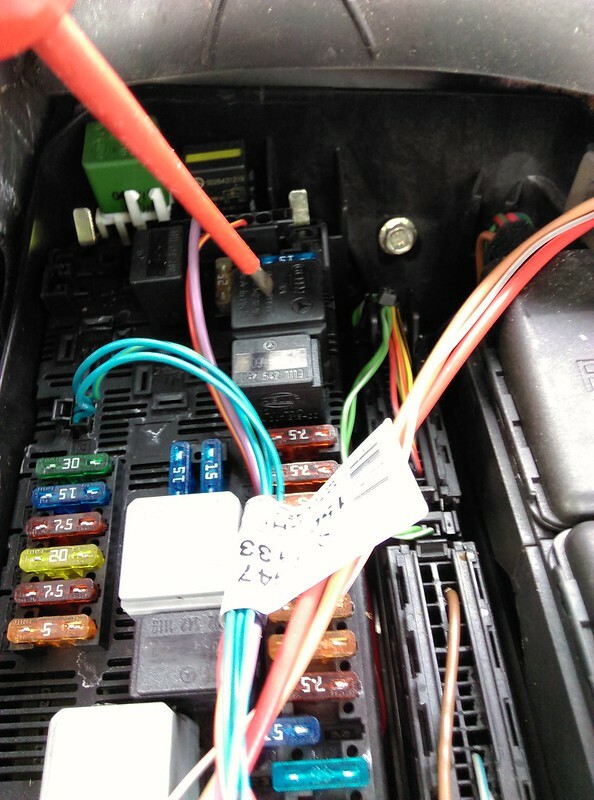 This is a diagram of the relays inside the drivers side engine bay fuse box. I have some others if you can be more specific which ones you need. Hmm, thanks for the info, though that layout doesn't appear to look like what's under my bonnet. Ive uploaded the pdf versions, the engine comparment is the same I've uploaded, are you sure its not the same? It does look different. I'm trying to identify this relay pointed to. The lay out looks different, to me it's too different for me to identify the items. Confusing a little (to me). Thanks for the uploads. On the sheet titled 'fuse and relay box general locations', where exactly will I find the fuse boxes which point to the bulkhead for F32 and the passenger door for F34? What it looks like your pointing to is Relay I. If you open your driver door, on the side of the dashboard where the door covers that section there’s a flat panel there, it will be behind there. There’s a small seration you can pry it open with, there’s two retaining clips and they can be quite tight. Use maybe a plastic tool or something to prevent any damage. Yes I think it is relay I. I'm wondering what exactly it does, it's possible this one may one I need to pay attention to. Thanks for the information so far. What problems are you experiencing or trying to trouble shoot? Not sure what terminal 87 on relay I supplies exactly, will need to look at the wiring diagrams to figure that out. Might be a 12V feed to the ECU which is N10/1KL I think.